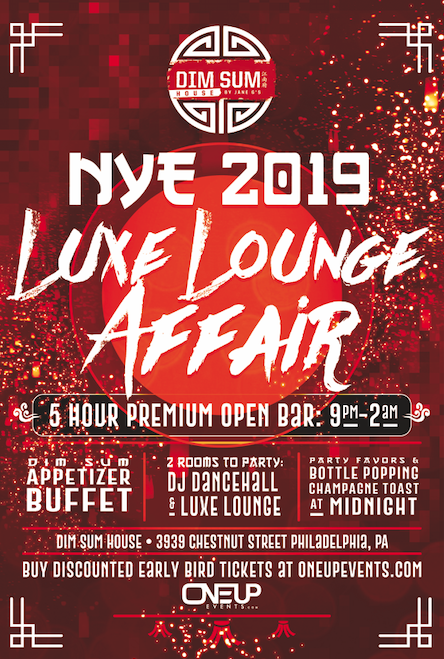 The leather laden Dim Sum House is hosting it's first ever NYE event in luxe fashion. Ring in the New Year at one of Philadelphia's swankiest nightlife venues. Sip on your favorite cocktails as all tickets include a 9pm - 2am premium open bar, come hungry as there will be a full buffet of the dim sum that food writers have fallen in love with, then party the night away with a DJ, Pool Table and enough seating for everyone to snuggle up when the time is right. Tickets are On Sale Now but Prices will go up as we get Closer to Selling Out. Buy Early and Save Big!